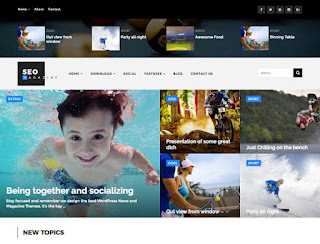 Seo Sports Mag Blogger Template is a Multi-Purpose Newspaper, Magazine Blogger Theme best suited for sites that deliver news about Technology, Fashion, Sports, Video, Healthy, Travel, etc. With SEO Sports, you only will not receive a beautiful, modern website but also you’ll have access to lifetime updates at no extra cost. Making this an excellent value Blogger themes for Magazine, Newspaper and Blog websites.